It’s no secret that the massive new mall in Balzac has been slow to get started. Only 11 small businesses currently occupy the 500+ store New Horizon Mall, leaving many of the hallways, units, and parking lots empty. A release from the mall states that this may not be the case come November, as an additional 28 stores are planned to open up for business within the next four weeks, leaving a total of 39 micro-stores for people to check out. “New Horizon Mall is not a typical mall. We are not leasing to the large regional and national retail chains you see in every other mall,” said Eli Swirsky, president of the mall’s developer, the Torgan Group, in the release. But, until then, the mall remains mostly empty — which made it the perfect playground for one Calgary rollerblader. 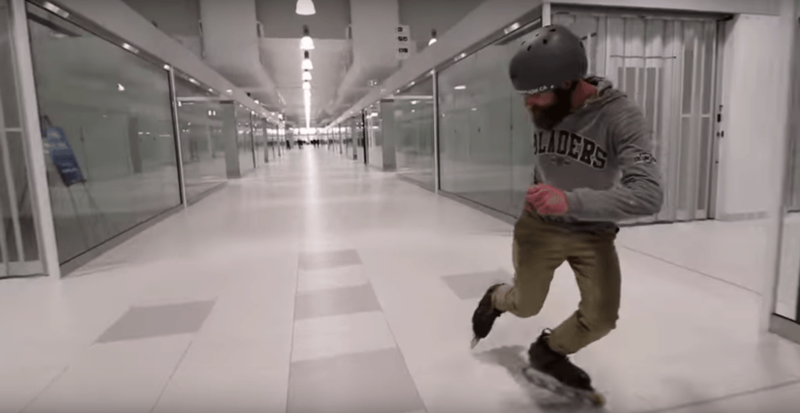 A YouTube video posted by Shop Task, the channel for inline skate store Shop Task YYC, shows a rollerblader making his way through the hallways, parking lots, and soon-to-be stores of New Horizon Mall.